On Saturday Nov. 25th I went down to the Derby Community for the 4th annual Derby 50K. 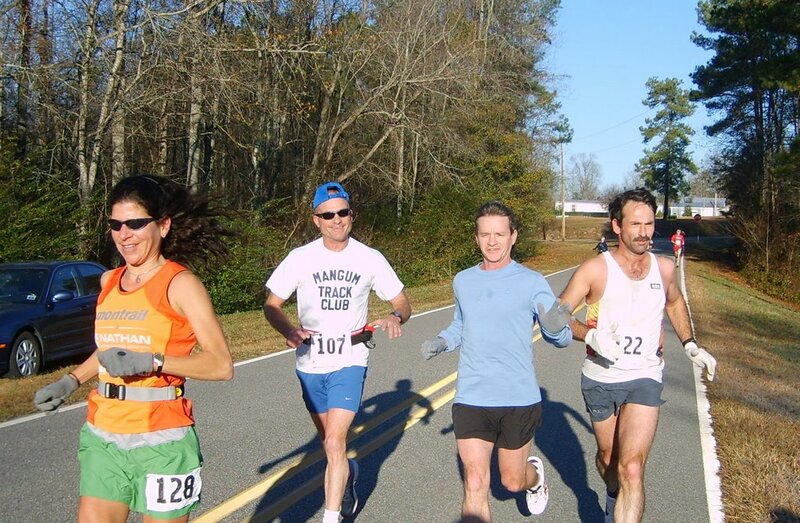 This is a low-key road race put on by Mark Long as a Mangum Track Club event. The course is 3 loops with a short spur to the start/finish line. It is a very rural area with very few houses along the route. Mostly farm and game lands. Although not a difficult course it has several rolling hills and a section of dirt road each loop. 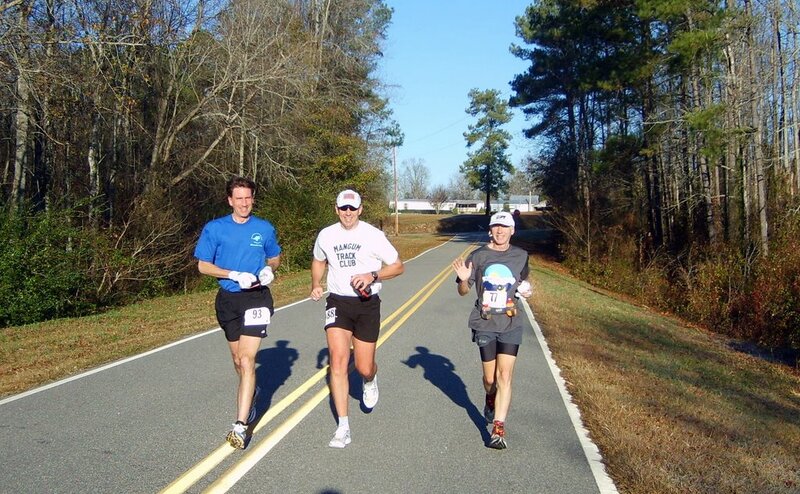 The photo to the left has Jay Finkle, Fred Dummar and myself as we enter aid station #1. Fred's wife Susan with friends and fellow MTC members Caroline Amberger and Lucinda Rigg were womaning this aid station. This is the early leaders at the same place on the course. Women's winner Annette Bednosky just out for a "jog" finished 2nd overall. Thanks for the comment on my blog. Found out about yours through the NCRC Yahoo group messages you've posted since the OBX Marathon. I've been enjoying your blog alot and have been meaning to let you know! Hope you don't mind that I've linked you on my blog. It's an easy way for me to check in on occasion. Glad to hear some others have found your blog through mine.